The greatest part of the MLB All-Star break in recent seasons has been the Future's Game. 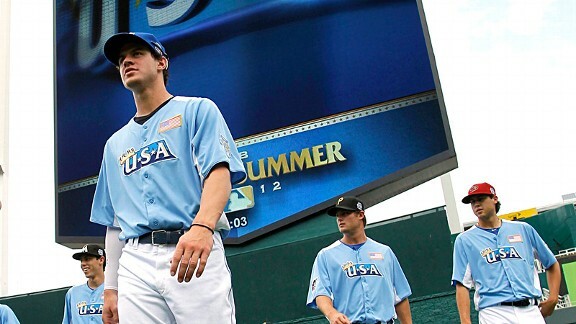 With the boredom of Home Run Derby, and occasional apathy towards the All-Star game, this rare look at the best prospects in the Minor Leagues competing against one another has been the only festivity worth much attention. Leading up to this year's game, we were particularly interested in watching Jurickson Profar, Billy Hamilton, Manny Machado, Dylan Bundy, Wil Myers, Taijuan Walker, and Mike Olt. How did those guys look? And, who else announced their presence with authority on Sunday Night? The consensus #1 position prospect in the country showed rare ability tomahawking a high fastball into a line-drive homerun several rows beyond the right field corner. As he continues to mature and get stronger, he will be a special player, providing power from shortstop. The fastest man in show business showed his wheels but also some flaws that he can work on before his Major League debut. Hamilton made an easy out in his first at bat and threw wildly to first on his first opportunity in the field. In his next plate appearance, Hamilton thrilled the crowd with a 2-run triple to deep center. In the conversation for best position player prospect in the land, Manny Machado draws comparisons to Cal Ripken, Jr. because of his size, tools, makeup, and franchise. Machado did not disappoint, with an inning ending double play in the top of the 6th, and a 2-run double in the bottom of the frame. The Baltimore Orioles have 2 of the top 5 prospects in baseball, with Bundy and Machado. Dylan Bundy threw just 14 pitches, 10 for strikes, in the 4th inning. He allowed 3 hits, but 0 runs, and fell into the Win by pitching before Team USA took a lead they wouldn't relinquish. The hometown fans got a kick out of seeing one of their prized prospects man center and right field, while showing off in the batter's box. The 21-year old slugger went 2-for-4 with 3 RBI and a run scored. As a multi-sport talent, Taijuan Walker brings rare athletic ability for a 21-year old kid of his size. He showed a legit ability to pitch in the mid-90's (at least for one inning), struck out Chih Fang Pan, gave up a single to Indians' prospect, Francisco Lindor, and got Oscar Taveras and Rymer Liriano to fly out to Wil Myers in center field. The Mariners may not have a great offensive team for many years, but they have the arms in the minor leagues to sustain an elite pitching staff in the very near future. Hultzen is not far off from helping the big club in Seattle. He hasn't dominated at Triple-A, yet, but time and talent are on his side. In the Futures Game, Hultzen flashed four pitches: Fastball, Sinker, Slider, and Change-Up tap dancing around 3 hits to allow just 1 run. 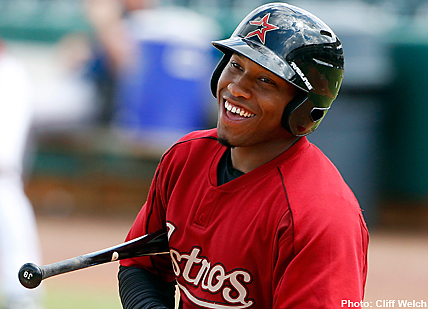 How about the left side of the Rangers' Double-A club, with Profar and Olt? The 3rd base prospect with a .404 OBP and 22 HR in 77 games, batted cleanup for Team USA. He only went 1-for-5, but his contribution was an RBI double in the 9-run 6th inning that put the game out of reach. The Pitch FX radar gun at Kauffman Stadium was running about 2 mph hotter than reality, but it still showed Fernandez throwing a free and easy 97, 98, and 99. Don't be surprised if Fernandez is a legit #2 starter in two or three years. The man with the funny name reached base in both of his plate appearances as followed up a 2-run home run to right field in the 2nd with a hard single to left field in the 4th. Cubs fans should try to hold off on too much excitement, as Ha has still only posted a .313 minor league OBP in 355 career games played. The hometown fans got a treat in watching their diminutive flame thrower. For a guy listed under 6 feet tall and 140 lbs are rarely seen hitting 100 mph on the radar gun. Kauffman Staidum's gun was a bit hot, but that's still real speed coming from a smaller guy. For a game that saw a lot of offense from his opponent, Ventura started them off with three ground outs from the first three batters. The leadoff hitter for the World team got 2 singles in 3 at bats and scored a run. you'll be smiling for a long time, JS. As an elite minor league batting prospect, Singleton did not disappoint in the Futures Game, but going 3-for-4, with a walk, run, and RBI. Singleton's consistency is impressive. His Onbase Percentages each year in the minor leagues have been: .395, .393, .392, and .393. Come next season, Singleton could be starting at first base or DH for Houston. Although he failed to reach base safely, the Braves catcher created buzz with his cannon arm from behind the plate. He ended the 2nd inning by throwing out Jonathan Singleton to complete a strike him out, throw him out, double play. With Shane Victorino fading in Philadelphia and facing free agency, the Phillies would love to have Anthony Gose back in their system. Gose singled and scored in the 3rd and walked in the 4th inning, but his most memorabel contribution was an outstanding catch in center field. With a ball hit deep over his head, Gose sprinted back and made a graceful, backhanded, diving catch of Oscar Taveras's 3rd inning sacrifice fly. With the Tigers being a veteran team that's all set at first, third, and DH, many project Castellanos to be used as trade bait for pitching or an accomplished batter in the outfield or middle infield. He did a lot on Sunday night to increase his trade value. The 20-year old Castellanos went 3-for-4, with a walk, 3 runs scored, and the decisive 3-run home run from the 9-run sixth inning. Not only did his blast add a crooked number to the scoreboard, it was an impressive 406-foot shot to center field. There are plenty of rebuilding teams who will trade a veteran for a young 3rd baseman with a career minor league line of .335/.386/.471 and power to all fields. The game turned into a walk in the park after Castellanos's 3-run HR.